Microwave 1 1/2 cups morsels in medium, microwave-safe bowl on HIGH power for 1 minute; stir. Microwave at additional 10 to 20-second intervals, stirring until smooth; cool to room temperature. Combine flour, baking soda, salt, ginger and cinnamon in a medium bowl. Beat butter and sugar in small mixer bowl until creamy; beat in molasses and melted chocolate. Gradually add flour mixture alternately with water, beating until smooth. Cover; refrigerate for 1 hour, or until firm. Roll half of dough to 1/4-inch thickness on floured surface with floured rolling pin. 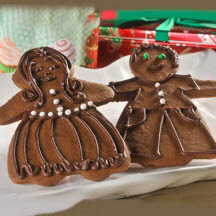 Cut dough into gingerbread boy and girl shapes using cookie cutters or a stencil. Place on ungreased baking sheets. Repeat with remaining dough. Place remaining morsels in heavy-duty plastic bag. Microwave on HIGH power for 30 to 45 seconds; knead. Microwave for 10 seconds; knead until smooth. Cut tiny corner from bag; squeeze to pipe chocolate. Decorate with piped frosting or icing.